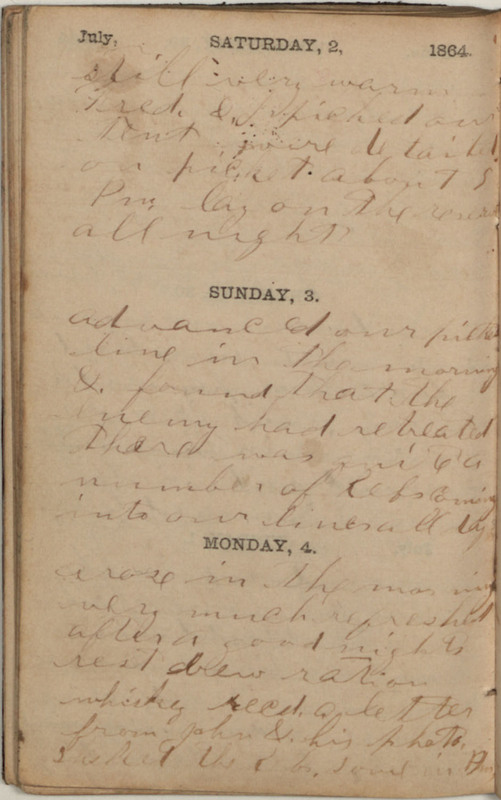 July, SATURDAY, 2, 1864. still very warm Fred. &, I piched our tent were detailed on picket about 5 Pm. lay on the reserve all night SUNDAY, 3. advanced our picket line in the morning &. found that the enemy had retreated There was quite a number of Rebs Coming into our lines all day MONDAY, 4. arose in the morning very much refreshed after a good nights rest drew ration whisky recd. a letter from John &. his photo. [?] the Rebs. some in Pm.